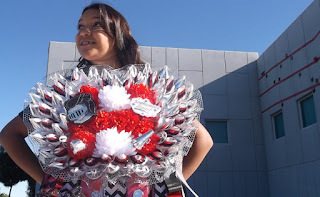 Once upon a time, in a land full of sarcasm and sass, I wrote this blog post about the crazy excessively large mums that have taken over not only the great Texas tradition of homecoming, but also the bodies of innocent high school girls all across the Lone Star State. Apparently, over nine thousand of you were interested enough to read through my diatribe. Y'all, it seriously makes me want to stage an intervention. I want to be all Tammy at the nail salon and say, "Girls, you so pret-ty like cheerleader... WHY?" 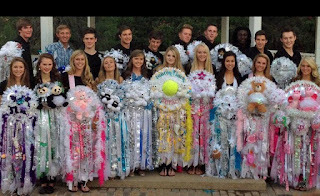 I want to gather each of the Texas beauties and remind them they have a body beneath all that ribbon and boas and stuffed animals and literal bells and whistles. SO, can we return to moderation? 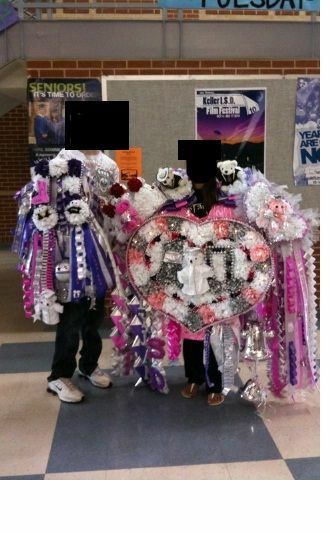 For those who are NOT from Texas or who are not familiar with this whole thing, let me introduce to you the very beginnings of this tradition for a guy to give his date a decorated fall flower--known as a mum--for the big homecoming football game where high school alumni came back to celebrate. See? Boy awkwardly pins a mum flower with some little streamers flowing down for his homecoming date. While Ward and June Cleaver look on. So of course, to improve upon such tradition, we obviously just get bigger and bigger, like Harry's Potter's aunt who flies away in the movie after his magical spell. And we somehow ended up HERE. Bless their hearts. That's right, girls. I'd have my identity hidden too if I was carrying around a Hobby Lobby floral section around my neck. Yep. We've gone from pinning them on your shirt to putting them on these neck holsters. I have a really hard time getting past that fact alone. Because here's what you wear around your neck, little sweet high school girls. Necklaces. Or maybe a scarf? Perhaps even some sort of neck tie if you are going for a gender neutral look. But a huge blob of streamers and teddy bears and literal glowing lights and things that makes sounds? And one other fine point I'd like to make about this whole homecoming gone mad trend is the way a boy asks a girl. And in this social media driven age, the creativity and elaborateness (is that a word?) and extravagance of said proposals are ever growing as the teens see the latest tweet from a successfully magnificent HOCO proposal. It looks a little like this. An entire pep rally skit in front of a whole school is literally a ruse for a HOCO proposal. Think the half-time at an NBA game that is actually a wedding proposal. Except these people cannot even rent a car. Or, the girl is showered with expensive and elaborate gifts from designers and expensive stores, and within that is the big question. These gift baskets are akin to the goody bags the celebrities get at the Oscars. Carefully plotted out schemes involving a multitude of people, props, and of course, huge bouquets of flowers. All to ask a girl if you can spend upwards of hundreds of MORE dollars to sit by her at a football game. Only the guy won't even be able to hold her hand because he won't be able to find it beneath the glitz and flora. The over-the-top stuff bothers me. Not just because I have boys, but also for my girl. Such pressure for a teenage boy to ask in some way that will be retweet worthy. And setting a precedent that will only demand more and more as the boys and girls get older. I personally do not want my girl having such high expectations. Unless someone is asking to marry her. Back in my day, the interested guy asked his best friend to check with my best friend about the potential of being his date. Of course, that is if the hypothetical question involves me actually being asked out. Somehow, that awkward four-way conversation evolved into the question of going together to homecoming and the decision was made by default. That's it. No posters, flowers, designer gifts, or elements of huge surprise and Pinterest inspired creativity. For the record, I'm all for my boys putting thought and consideration into asking a girl out. Their daddy has trained them carefully over many the camp fire on male-only camping trips, coaching them on how to treat a girl. But, those conversations did not involve brainstorming sessions to created the biggest, baddest, most noteworthy HOCO proposal. Oh, how I could go on. Truly, I've written a sequel to my original post every time I see another photo of one of these over sized creations. I wonder what those transplanted to Texas think of this phenomenon? Do they want to immediately return to the saner states from which they came? And when Yankees read this blog post, what must go through their minds? So on and so forth. I could rant for ages about this. But it's all fun and games until you find yourself on the flip side. Oh, yes. So easy to play armchair quarterback until the day comes. When your son decides to ask a girl to HOCO. And you suddenly see the OTHER side of this equation. You suddenly feel their angst about doing it all well enough so that it feels acceptable to the girl. It's the clash of theories about HOCO meets the reality of HOCO. Because the truth is, I wanted my guy to feel good about how it all went down. I wanted his friend whom he asked to feel special and to feel like it was thoughtful. I want this girl to feel proud to wear a mum from my son. And I want my son to feel that both his "proposal" and the mum are acceptable. Suddenly, I am 16 again and looking around at what everyone else is doing to gauge what I should do. And I feel stuck between not wanting to keep up with the Joneses or cause a permanent neck issue by creating a mumstrosity... and also wanting to not stick out like a sore thumb. Because I well remember those years when I did want to blend to some degree. And I cared about fitting in with my peers. So what's a Mum to do in this mum-eat-mum world of Texas homecomings? That's where I am, bloggy friends. That's the struggle. And the struggle is real, albeit a completely First World Problem of epic proportions. Thankfully, the asking went well. And it did not involve a trip to the Dallas Galleria or the need to go into debt. Now that I have personally entered the arena of modern day mums instead of complaining from the sidelines, I'm falling back on my go-to approach. After all, I do not want her picture to appear on Google images with her face blacked out and my kid's name in glitter letters down one of the 3,478 ribbons that are serving as a barricade to her personal space. For other newbie Mums making mums, here's a few things I've learned. 1. Apparently, there is some pecking order to mums according to grade, at least from what my sources tell me. In other words, freshmen mums are more moderate and involve being a single mum (AKA one silk mum flower). As the years go by, the mums get bigger. 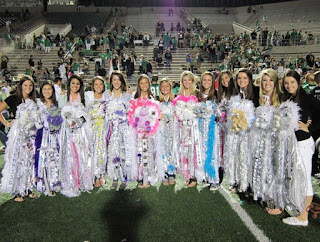 Mums for senior girls involve the idea of four silk mums, are completely white and silver, and include all manner of Crazy Town. Good intel, huh? 2. 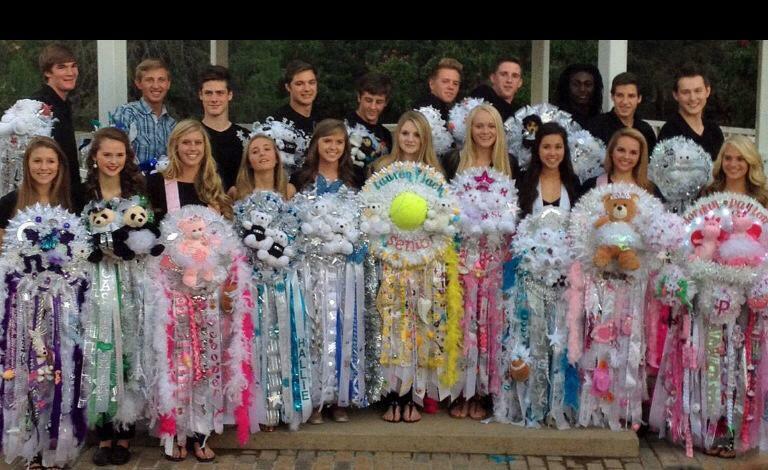 You can order a mum completely made. I've been told that this can be a more expensive option, but less headache and no permanent scarring on the fingers from your hot glue gun. However, if you are buy enough of all the doo-dads and build your own mum, it may actually NOT be a less expensive route. So sounds like a toss up. 3. You can buy the "base" and build from there. In other words, shop around the crafty stores and find a basic model. I would say use your 40% off coupon. Then build up from there to personalize it and make it glitzy and fab. 4. It is always a good idea to pump mutual parties for Intel, when you as the mom do not really know the girl your son is taking. (By the way, taking where? No where. There is no dance at our high school. Your date wears her mum to school on game day, you get some street cred for not messing the whole thing up, and then you sit together at the football game. UNLESS your date is a cheerleader. Then, she cheers and shows off your glorious contribution to the time honored mum tradition from the sidelines). Back on point, ask a friend to ask her daughter who knows the girl for some ideas on what kind of bling to add to the basic mum. 5. I'm all for a Mum making party. I intend to gather whichever friends want to come to tackle this together and make it fun. I can remember how much fun Homecoming was when I was in high school, so my new mantra is to embrace the idea behind it and be part of facilitating a good memory for all involved. 6. I might need an intervention when the time comes for Senior Year and they have upped the ante and the expectation is higher for mums. Or, I may need to grab those darling high school girls and take them to a lovely lunch where we discuss the perimeters for the mum. I can offer to donate to a worthy cause in her name and she can agree to keep the crazy out of the mum. This conversation will likely involve a power point slide show of Mum Fashion Do's and Don'ts. So there you have it. While it is still 900 degrees here in Big D, the calendar begs to differ and it is sounding the alarm bell for the impending Homecoming. And while I used to sit back and wax poetic in all sorts of snarky ways, I must admit that my words have come back to haunt me. Sorta like the days I was the best mom ever because I saw all the ways it wasn't done as well as I would do it. And I had yet to have a child. Yep. Humility often comes to those who pridefully bash a tradition in which they will eventually need to participate. And it has caused me to go from all sorts of analyst and commentator to one who needs to eat my words. Because while I still think the excess is beyond and I wish we could save extravagant "proposals" for marriage, I am now smack dab in the middle of the feelings of teenagers and I'm feeling all the feelings myself. I want my kids to have fun and make memories and participate in these traditions. The truth of it is, no one talked me off the ledge of those big 80's bangs and hair. No one staged an Aqua Net intervention on me. I think they were all too busy laughing at how ridiculous I looked. I think they'd all gained the wisdom with age to know that I'd eventually figure it out on my own and decide I was ready for change. I'm not sure I'm ready to acquiesce that far on this excessive mumstrosity situation. But I can be a big enough Mum to say that there can be a way to honor the tradition and not lose my mind or compromise my morals. I'm still the hugest ever fan of Mum alternatives that involve donating to charity. And I still want to really behind that battle cry. But in the meantime, I can admit the need to surrender to the whole mum thing within reason. I can remind myself as I build that mum and burn my fingers, that I am bringing a smile to a lovely teenage girl's face. Hopefully. And the mum I make shall hang on her walls during these teen years marking this season as a time that she can always remember with joy. While also giving her plenty of fodder for future blog posts and musings.